RAIL CAR COMPANY HEADS FOR FRIENDLIER NEIGHBORHOOD-Sounds like the perfect job/manufacturing plan for Southern California, right? We're starting a host of decades-overdue rail projects, most of them light rail, and having global rail car leader Kinkisharyo build just under $1 billion of light rail cars in LA World Airports-leased land in Palmdale is a no-brainer, right? Wrong! Until the enlightened IBEW and other labor unions who dominated the opposing "Antelope Valley Residents for Reasonable Development" came along, an agreement with Kinkisharyo to build this rail car facility in Palmdale seemed like an obvious fit for all parties involved. Publicly, the opposition claimed to be concerned about environmental factors, but the REAL problem was that IBEW Local No. 11 and Kinkisharyo could not agree on using card check at the proposed facility to create a union and collective bargaining. 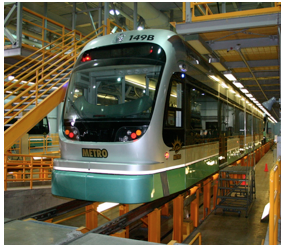 Kinkisharyo is the El Segundo-based U.S. arm of Kinki Sharyo Co Ltd. of Osaka, Japan, and is on a legally-imposed deadline to meet its commitments to Metro to build dozens of cars for the future Expo Line, Foothill Gold Line, and our expanding LA County MetroRail system. The first delivery is due this month. ...except this was vacant land in Palmdale, and even in LA the option of a Mitigated Negative Declaration (no EIR, but some mitigations) or Negative Declaration (no EIR) can fit the bill under the right circumstances. Time was of the essence! So much for California building a green economy, as Kinkisharyo follows Tesla out of the California anti-business environment that gets in the way of building jobs, lives and a better future for all. This wasn't overdeveloped LA but underdeveloped Palmdale (home of the airport that the airlines have abandoned), and JOBS should have been the order of the day. The land was there, the zoning was right, and the rail cars are so overdue they should have been built yesterday. But the IBEW never loses a chance to lose, and now our future light rail fleet will be built outside of California. So meanwhile, while the rest of us often have to resort to multiple jobs to stay ahead, or leave retirement to make sure we're financially stable, the good people of Palmdale will have the golden opportunity to have no jobs whatsoever. Or maybe residents of the Palmdale region can follow Kinkisharyo to Nevada, Texas or anywhere else that realizes that job creation is the critical underpinning to any region. Way to go, IBEW and Big Labor. Glad we got you looking out for the little guy!